Despite its rank as a 5th Growth, over the last 10 years, Chateau Pontet Canet has become one of the rising flagship estates of the Pauillac appellation, rivaling in quality with some of the best and more established higher ranking Chateaux of this renowned appellation. Bought in 1975 by the Tesseron family and now owned by Alfred Tesseron, the property, located south of Château Mouton Rothschild and Château d'Armailhac, in the heart of the Pauillac appellation, encompasses 80 hectares of vineyards on poor sand and gravel soils planted mainly with Cabernet Sauvignon, the signature grape to produce great Pauillac. Eventually gaining more recognition after 20 years+ of hard work and devotion, Alfred Tesseron and its team’s efforts where highly rewarded within this last decade more particularly with stunning, consistent and expressive value wines produced good year, bad year since the 2000 vintage. The 2003 vintage has a riper style than usual due to the summer heat wave of this particular vintage; yet balanced and harmonious, which wasn’t the case for a lot of Bordeaux in 2003, it is in my opinion one of the best crafted wines of the Pauillac appellation (for this vintage). The 2003 Chateau Pontet-Canet possesses a deep ruby-garnet color of very good intensity and bright reflects. The nose is warm, expressive and ripe with rich aromas of dark berry, ripe plum, leather and cedar intermingled with oak and spicy notes. 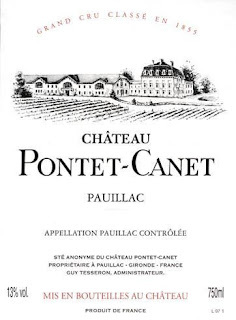 Despite the over-ripeness combined with inharmonious features and weird green tannins characteristic of the 2003 vintage for most Chateaux in Bordeaux, the 2003 Château Pontet-Canet's palate seems to be one of the rare exceptions. It offers very good balance and texture, with ripe dark fruit yet enhanced by good acidity and framed by present yet integrated tannins. Offering plenty of generous dark berry fruit flavors mixed with earthy and woody notes, this is not a classic Bordeaux “per se”, yet it is more traditional somehow than most of the other unbalanced fruit bomb produced in Bordeaux this particular year. The quality of the fruit, the balancing acidity combined with the tannins in the finish and the overall profile of this wine suggest that it could keep for quite a few more years; yet I wouldn’t wait too long. It is just a suggestion and a personal opinion but I think that most of the 2003 Bordeaux will not age greatly and may fade sooner than expected (I may be wrong but I kept my impressions since I taste them "En Primeur" in Bordeaux and many time after when bottled. See my previous post about Bordeaux wines and my opinion about the different vintages).